Well here we are on day 2 since the news broke about the upcoming change in employment visa laws and it’s clear that there are two camps on this issue: The unhappy camp, and the happy camp. The unhappy camp is primarily made up of expatriate employees, while the other one is mostly Omani’s and employers. Not really rocket science there. We’ve all had more time to think about this news and I’ve come up with the following observation to this change in policy. There are so many suggestions and questions that have come about as a result of this announcement and quite rightly people deserve answers. What some people appear to not quite comprehend is that even though there are expatriate workers here in Oman, many have made their lives here and some even call it home. I’ll go into some suggestions that I should hope would at least be considered and commented upon (obviously not here, but I mean publically) by the concerned authorities, but before starting I’d just like to point out what is currently fact. Come July 1st (or is it June 1st now), no expatriate workers will be allowed to change their employment visa without a 2 year hiatus from the Sultanate. Lets not dress it up or sugar coat it, it’s a clear message: You work the job you came here on (or are currently in) and then you go. That’s it. 1 1) If an expatriate is a property-owner in the Sultanate and desires to change job, they now can’t. What happens if an expat property-owner loses their job due to Omanisation or simply weak market conditions and their employer has to cut staff or even wind up? It beggars belief that these people would not be granted the right to seek an alternative job. This policy change effectively destroys the ITD property market – only a fool (or a someone looking for a holiday home or a retiree) would make a decision to purchase personal property in an ITD here now. Granted there is still a market for international investment houses, but the demand is weakened in an already weak market. I wonder what property values at The Wave and Muscat Hills are going to be at in a year? My suggestion is to grant exceptions to all expatriate property owners in the Sultanate so that they may change their employer if they choose too. 2. 2) If an expatriate is brought to Oman by a company to do a job, and they fulfil the terms of their Contract, why should they have to leave Oman if they want to change jobs? They have completed their Contract, they are locally experienced and would be an asset to any employer and by extension the economy of Oman. It should not be a minimum of 2 years’ service for an employer, it should be the terms of the employment contract, and whether it’s been fulfilled or not. I am an internationally experienced consultant with significant experience in my field here in the Sultanate. Once I complete my contract with my current employer, what right over me do they have to prevent me from seeking work with another company here in Oman? The obvious answer is none – if you don’t want to work for that company anymore, you can leave – you just can’t stay working in Oman. But that’s not really very fair to workers, nor particularly well thought out for the local market in general. This policy effectively guarantees a brain drain of the long term expatriate skilled workers here. It also is a clear message to foreign workers looking to move here that there will be little career advancement whilst working here. But here is my real question (which I’m sure will go unanswered by the powers that be): What is the logic in allowing a company to seek and receive an employment visa for a foreign worker for exactly the same position that would be given to a locally experienced expatriate worker who has completed the terms of their current employment Contract? This is exactly what the point of the No Objection Certificate was for previously, but obviously it was abused by unethical employers who refused to sign it simply as a f*ck-you to the employee that wanted to change jobs. 3. 3) What if an expatriate is married to an Omani and wishes to change their job? Again, here, I feel an exception should be made, and not on a case by case basis. Be upfront and have clear rules: If you are married to an expatriate, you can change your job. The current policy means that the ROP and Ministry of Manpower would rather split up families than allow people to change their jobs. Sounds harsh and far-fetched – but is true. 1. 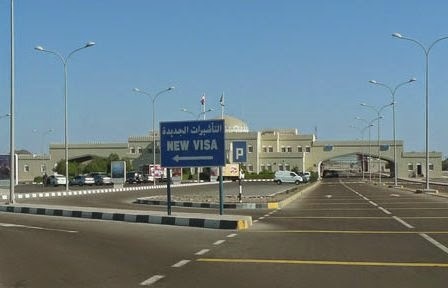 4) If an American citizen who has been working here in Oman has, due to the Free Trade Agreement with the USA, successfully setup and registered a business here, how would they change their visa? It seems pretty clear to me that an exception would have to be made or this would be breaking the FTA, no? There’s plenty of other questions but for me, these are my big 4. To a lesser extent this policy change means it’s going to make it even harder for expats to obtain loans (which many use to pay the ridiculous demand of 6 to 12 months rent upfront) which will have a knock on effect on rental prices here too. Which means Financial and Property markets are going to suffer as a direct result of this. I’m not against the policy shift in general, it will certainly slam the door shut on those that job-hop, but I think we all know why this policy shift has been announced; and it’s not to “protect” employers interests. Time will tell, and perhaps we’ll see revisions. Nothing is ever set in stone. So, enjoy Oman while you are here, because the adventure that is the Sultanate of Oman will end for all of us expatriates eventually. For those of you “expatriates” who are born and raised here in Oman and call it home, my heart goes out to you. The message from on high is clear and unequivocal: Oman is closed for business and not a serious player in the global economy. When labour laws become this restrictive no international business can take investing here seriously, and that goes for the oil and gas industry too. I totally agree with the point you put forward and I am glad that you brought it up. There are alot of things to be considered as mentioned and elements that do not fit to the rule issued. Granted that there might be a few straight forward cases but then as you mentioned there are alot of other exceptions which need to be considered. Hope that the it would somehow reach those concerned with setting up and enforcing the rule. It seems to be very much surprising that in the time where Omani are asking to get highly developed and when they are asking to become like some neighboring countries; here they go with such rules and regulations that shows the absolute opposite. How can you ask for much if you aren't willing to have a mentality that supports such! The rule will destroy communiies. People who enjoy living here, respect the country, and have friends and family here will be forced to leave if their job ceases. New jobs will be taken by people who have no local experience, and might not stay long. This may well costs employers more, as they might have to recruit several times to fill positions that could have been filled locally. Also 'local hires' are not always more expensive 'job hoppers' - most of the time the contract will exclude housing and other benefits if the person is hired locally, and the overall package will be less that what it costs to bring in a new person (plus companies also have to pay huge relocation costs and shipping)..
Why is UAE booming? They make sensible decisions. oh.. and where will the locally experienced people go? This is a major problem with the way rules are made here. If indeed it's not clear with regards to all these issues, why was the rule passed without considering all these important points? If this was thought about, and was considered, what kind of rule comes out in a tiny "announcement" paragraph without any clarity whatsoever? Why does Oman continue to apply laws without any clarity and in haste? All to force an agenda into place which by now they should have realized, they cannot force. This is NOT the way to go about with Omanization. Don't alienate skilled foreign workers inside the country. Control foreign workers from coming in, especially unskilled. If all the unskilled positions are filled by Omanis, there would be a massive drop in the country's expat population. Would also force companies to abolish the modern day slavery which is prevalent in the country. MM, you have addressed the most important issues relating to this new rule. It is truly disheartening for expats already living and working here and for those that call Oman their home for many years but cant get citizenship here. This country is for Omanis first and foremost, and they have first right to all jobs, provided they fill the job requirements. I grew up in Oman, got my higher education in the west, gained some experience and came back here to be with my family and work here. I am now quite sure my time in this country is limited. It will be a sad day when I have to leave family, friends and a lifestyle I have spent my entire life in behind. THis law did not consider so many situations. A friend, quit his current job after 10 years for a better opportunity in another firm. He is currently serving his notice period and this law has suddenly turned his life upside-down. His new company cant process his visa and his old firm cant give a NOC. He will have to uproot his family and go back with nothing in hand for no fault of his own. Is this in any way fair? So an Omani can change 3 jobs in a day, just coz (whatever - my vans ac doesn't work etc)? But if an expat wants to change a job (for whatever reason such as ill treatment / progress etc), s/he will have to wait for two years outside the country before coming back, why? It gives more leverage, to many of the notorious employers, for further ill treatment / exploitation of their expat employees. I worked in Oman many years ago and found it a welcoming place for expatriates. I have since moved on to bigger and better things, but this new trend has me concerned about the direction Omani labor law is headed. We should all be concerned about human rights. I would not like to see an Omani / any worker treated this way in another country. Saying that you cannot have your family join you for 6 months after you start a job in Oman, is simply inhumane! Oh and yeah, if you are a Woman, forget it - no place for you in Oman. Racial preference, discrimination based on gender and treatment of the word 'expat' / 'employee' as a commodity, is not going to take Oman into the next century as a leading example - as many of us expats have dreamt of. I'd rather prefer / welcome an income-tax law for expats - but then again, that would mean giving them Rights! What I've been saying all along, expats are no more and no less than the hired help and expat that thinks otherwise are kidding themselves! You can call me a loser all you want MM, but a fact is a fact. This is the 3rd or 4th time this law has come into play. They pt it out there for a few years, allow the best to leave, withdraw it and start it all over again. One question / point that I have not yet seen addressed anywhere - does this affect those who may be coming up for the end of their two year contract, but are still staying with the company, so have to go through visa renewal? It's renewal with the same company, not transfer, or leaving, but how does that fit? Would also be a time or opportunity for a company to say thanks and goodbye?